Tilse Areleth is a Dunmer trader living in Bliss in New Sheoth. She owns a general store named Common Treasures and buys and sells everything except spells. Common Treasures is the only store where you can buy clothing of both Mania and Dementia. She sleeps from 10pm to 6am in a double bed in the room above her shop, and eats breakfast in the same room for two hours. At 8am she heads downstairs to open the shop and then stands behind the counter for twelve solid hours. At 8pm she locks the doors and heads upstairs for a well-earned dinner, before heading to bed once more at 10pm. 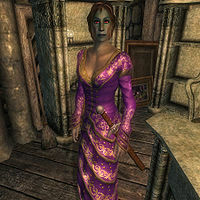 Tilse wears the unique upper-class light purple regalia and carries a leveled shortsword, up to ebony standard at level 20. She also owns the key to her store, and a few coins. The store contains little of interest beyond several ingredients scattered about, and a few bottles of wine and beer. She is evidently not a big reader as the store is one of the few houses with no books in it. Citizens in New Sheoth are divided over the merits of Tilse's merchandise. Some will say, "Tilse Areleth has quite a collection of things for sale at Common Treasures. ", while others take a different view: "Common Treasures is full of junk. That's all Tilse Areleth collects." During private conversations they will add: "I've shopped with Tilse many times." and "A bunch of junk. That's what it is." Unlike many of her fellow citizens, Tilse seems sane... until she starts to speak, at which point an unhealthy obsession with "things" emerges. When you approach her she will just ask: "Can I help you?" but her greeting will prove her obsession: "Something you need? So many things to need." She will bid you farewell with: "If you find any interesting things, let me know." When you take over from Sheogorath she will say "The Madgod graces us!" and "My Lord, what is mine is yours." She will humbly say goodbye with: "It has been an honor speaking with you." "A stranger in the Isles is interesting news. Perhaps this stranger has interesting things...?" "Sad about the Gatekeeper. I wonder if he had anything worth keeping?" "The Resonator draws adventurers to it once again. I suppose they won't need their belongings." "Good that Thadon got his Chalice back. I'd hate if someone took mine. Or anything else, for that matter." "Another conspiracy in Crucible. That's fine. Just stay away from my things." "Thadon is gone. I wonder if he left anything worth keeping..."
"Passwall is in ruins. I should see what they left behind." "The Gatekeeper has been reborn. I wonder if there are pieces left over...."
"Sheogorath's armies have returned. They'll protect me while I protect my belongings." "Our Lord is missing? Perhaps I should get his things. To keep them safe." "Order is gone! They didn't leave anything interesting behind, though." Should Tilse die during the game, her gravestone in the New Sheoth Graveyard records her obsession with possessions: "She couldn't take it with her." This page was last modified on 20 October 2015, at 06:36.